NOAA's GOES-East satellite captured the developing Nor'easter "Juno" in this image, taken on Jan. 26, 2015. New satellite imagery shows the monster winter storm now battering the northeastern United States with snow as it gathered strength for what may be an epic snowfall. The huge storm's claws are definitely out in the photos, which were captured from Saturday through Monday (Jan. 24 to Jan. 26) by the U.S. National Oceanic and Atmospheric Adminstration's (NOAA) GOES-East spacecraft and combined into a new movie that shows the storm's development and movement. Weather forecasters are predicting blizzard conditions for parts of the northeast coast on Tuesday. The potentially historic blizzard is expected to dump 1 to 3 feet (0.3 to 0.9 meters) or more of snow throughout the Northeast and lash the region with winds that could gust up to 60 or 70 mph (96 to 113 km/h) on Monday night through Tuesday (Jan. 27), experts said. The new imagery overlays cloud data gathered by GOES-East in visible and infrared light with true-color photos of land and sea captured by the Moderate Resolution Imaging Spectroradiometer (MODIS), an instrument that flies aboard NASA's Aqua and Terra Earth-observing satellites. The image-processing work was done at NASA's Goddard Space Flight Center in Greenbelt, Maryland, where the joint NASA/NOAA GOES Project is based. "GOES" stands for Geostationary Operational Environmental Satellite. Spacecraft in geostationary orbit have an orbital period equal to Earth's rotational period, allowing them to observe the same swath of the planet continuously — an advantageous position for many communications and weather satellites. 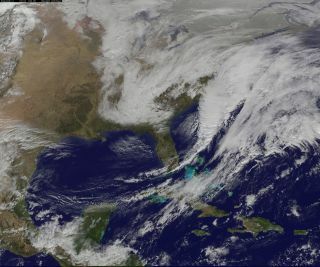 The snowstorm underway now is a nor'easter, a type of storm that gets its name from the fact that its winds blow primarily from the northeast.